Why your brain is fooled when you look at this image. What a pretty pastel image. 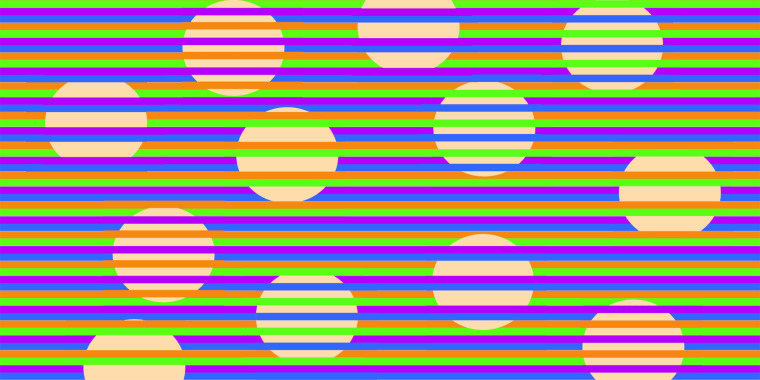 You’re seeing circles of several different colors, right? Actually, your eyes and your brain are deceiving you. All the dots are the same color, but are perceived by your brain as four different hues. The image, titled “Confetti,” was created by David Novick, a professor of engineering education and leadership at the University of Texas at El Paso, and quickly went viral after it was posted on Reddit last week. The graphic is likely the most advanced and complex version of the Munker illusion, a well-known optical illusion. Novick said it works because our brains tend to complete the colors over the gaps — so the space between the stripes of color takes on some of the hue of the stripes, known as the color-completion effect. The foreground framing colors "tint" the circles in our minds. In other words, our perception of color is “influenced by the neighborhood,” wrote Michael Bach, one of the experts in the field and a professor at the University of Freiburg in Germany. Novick was also inspired by the beautiful illusions created by another expert of visual perception: Akiyoshi Kitaoka, a professor at Ritsumeikan University in Japan. To make the illusion go away, just look closer. Basically, zoom in and bring your nose to the screen. “Because the Munker illusion depends on color completion, increasing the distance between the stripes makes the illusion go away. That’s why zooming in on an illusion like ‘Confetti’ reveals the dots to be the same color,” Novick told TODAY. You can see more examples of his work on his web page and Twitter account.